Bendy In Nightmare Run is an action-packed boss runner from Joey Drew Studios. Play as Bendy, Boris the Wolf and Alice Angel as you swipe to jump, dash and counter-attack four of the largest, nastiest bullies ever depicted in the classic 1930’s cartoons. 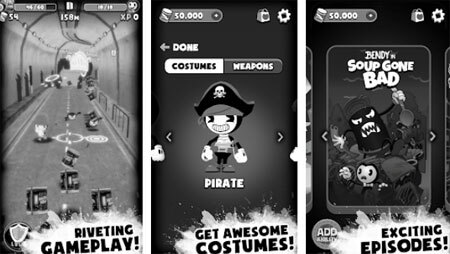 The action never stops as you fend off enemies, avoid obstacles and navigate your way through pirate ships, city streets, a junkyard and a not so quiet library. Bendy needs your help to stay out of trouble. Collect weapons and level up your character. Improve your abilities by collecting and spending cans of delicious Bacon Soup. Customize your characters with never-before-seen costumes and episode-specific weapons. The game features four unique cartoon worlds, collect bacon soup to unlock new characters, costumes and more. If you get stuck in the game, check out the video walkthrough and gameplay for the game. This entry was posted in Android Games, iOS Games, Mobile Games, Walkthrough and tagged Bendy in Nightmare Run Cheats, Bendy in Nightmare Run Cutscenes, Bendy in Nightmare Run Endings, Bendy in Nightmare Run Game, Bendy in Nightmare Run Gameplay, Bendy in Nightmare Run Guide, Bendy in Nightmare Run Hints, Bendy in Nightmare Run Jumpscares, Bendy in Nightmare Run Review, Bendy in Nightmare Run Solutions, Bendy in Nightmare Run Strategy, Bendy in Nightmare Run Tips, Bendy in Nightmare Run Walkthrough by Marvin. Bookmark the permalink.